Let’s get something out of the way right at the start – the purpose of this article is not to defend the Stormtroopers themselves, but to defend the efficacy, or effectiveness, of the Stormtroopers – it’s hard to actually defend the actions of the Stormtroopers since they were involved in some pretty egregious atrocities during the Empire’s galactic rule. See, as most of us know, one of the most notorious running jokes in nerd culture, even more-so than the excessively high casualty rate of Redshirts in Star Trek, is the Stormtrooper’s inability to hit their targets. It’s become so ingrained in our collective consciousness that the writers of the show Rebels even paid homage to it. Time and time again we see this supposedly elite fighting force appear as effective as the B1 battle droids. Could there be a reason that might explain just why the Stormtroopers, who are presumably highly trained, have a hard time zeroing in on a princess, a smuggler, a farm boy, two slow-moving droids, and an enormous Wookiee? It turns out there just might be. Please note: I won’t be using the “its just a movie” argument, because that’s no fun. How am I supposed to overthink something if I just say “its just a movie?” Now, let’s take a look at a few examples of the efficacy of the boys in white. 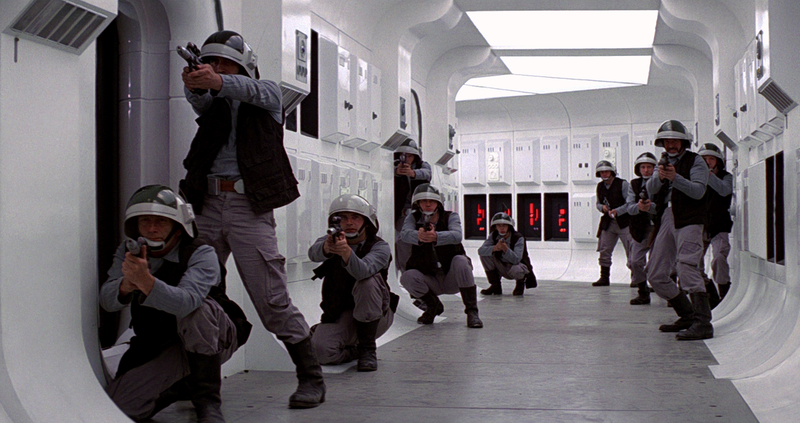 At the beginning of A New Hope we see long hallway filled with frightened rebels all with their guns pointed at the only entrance to the Tantive IV. Even with superior numbers that kind of choke point is incredibly dangerous, but the Stormtroopers take over the ship and capture the princess with minimal casualties, and at least one of those casualties was because Vader ordered them to capture Leia alive. The only reason the stolen Death Star plans got away was because the Empire was incredibly stingy with their turbolasers. I’m no expert when it comes to close quarter combat, but that was a thorough routing of the Rebel soldiers with minimal loss in an incredibly dangerous environment. I’d call that pretty efficient. Sure there was that little fiasco on the Death Star, but before we get into that lets talk about that desolate ice rock that’s called Hoth. The next time we really get to see the Stormtroopers take on a force of Rebels is when the Empire attacks the Rebel base located on Hoth, which really wasn’t much of a fight. The Rebels were so outmatched that their only real objective was to just hold off the Empire long enough for them to evacuate and find another hiding place. It’s wasn’t just the superior firepower of the Empire that won that battle, but also the skill and accuracy of the Stormtroopers as they breached the base and went ice-cave to ice-cave routing the Rebels as they try to escape. Later in Empire Strikes Back, we see them silently take over Cloud City in its entirety, capturing all of the Rebels except for Luke in the process. When the heroes escape, it’s only because Vader was wholly focused on turning Luke to the Dark Side and not the minor distractions that were the rest of the heroes. Now that I’ve laid out what I hope are convincing displays of the effectiveness of Stormtroopers (outside of that last example), let’s explore why they might have been so ineffective when it comes to capturing or killing the heroes. After mopping the floor with the Rebels aboard the Tantive IV, which was really nice of them considering the mess they made, the Stormtroopers have an incredibly hard time capturing a handful of heroes aboard a moon-sized battle-station that is literally full of Imperials. That’s pretty damning. I mean, it was literally three guys, a Wookiee, a princess, and two droids, while the Death Star had a couple hundred thousand Imperials aboard. Sure some of those were support staff like accountants and barbers, but there had to be tens of thousands of Stormtroopers aboard. That makes their incompetence seem almost unforgivable. But what if they were ordered to be incompetent? There is actually some pretty convincing evidence that this is the case. 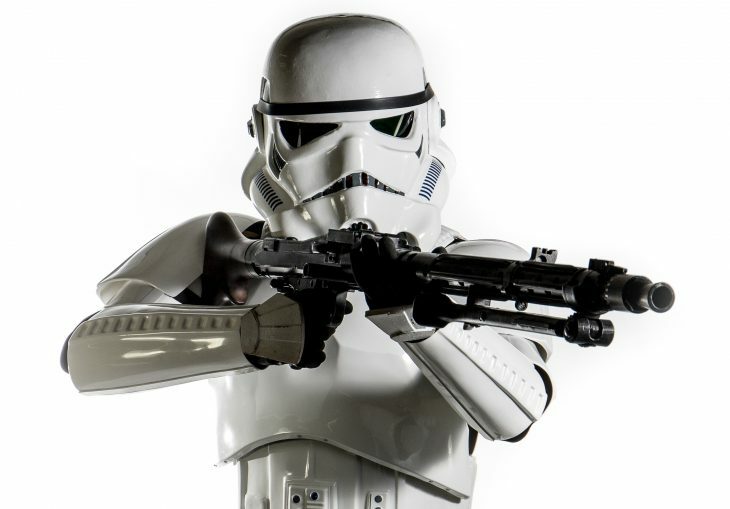 Lets look at a few instances the Stormtroopers appear particularly incompetent and look at how these incidents could be interpreted a different way. After their strong show of force at the beginning of A New Hope, the Stormtroopers drop the ball in spectacular fashion when the heroes unwittingly end up on board the Death Star. Han, Luke, and Chewbacca waltz right into the detention level and rescue Princess Leia before they all escape into the bowels of the Death Star via a trash chute. After narrowly (literally) escaping being crushed to death, the heroes work on returning to the Millennium Falcon, hoping that Kenobi has shut down the tractor beam. The show of incompetence increases when Han and Chewie chase a group of Stormtroopers down a hall, and when the troopers finally realize how absurd it is that they are letting one guy and a giant Wookiee scare them off they are woefully inaccurate and let them escape. Luke and Leia also make an improbable run through the bare, if not stylish, hallways of the Death Star. Before swinging over the infinite chasm of doom, twins are able to outrun a group of Stormtroopers who can’t figure out that you can shoot under doors, and also manage to kill a pair of troopers that have the high ground, which is no easy feat. How is it that these highly trained Stormtroopers who outnumber our heroes somewhere around 7,000 to 1 fail miserably at capturing them? That one quote completely changes everything. Tarkin let them escape in order to locate the Rebel base, which he totally does (although it doesn’t work out in his favor, it’s still pretty impressive)! Those Stormtroopers were ordered by one of the most powerful men in the galaxy to let the heroes to escape with the princess. That means that they willfully allowed themselves to be killed while purposefully missing their targets. I hope they made extra room in their cod-pieces for the massive balls required to follow those orders. Later, in Empire Strikes Back, the Stormtroopers have an equally difficult time capturing Luke on Cloud City. Again, this had nothing to do with incompetence and everything to do with Vader wanting them to shepherd Luke into the underbelly of Cloud City so that he could turn him to the Dark Side… or slice his hand off and reveal that one of the vilest villains in the galaxy is his father. Now, the Imperials did kind of get their white-plated asses handed to them by Ewoks on Endor. Even though Ewoks get a bit of a bad rap from a majority of people, I have a bit of a soft spot for these tiny, inquisitive, homicidal creatures. In fact, me and my wife (who possibly likes Ewoks as much as our children) even named our first dog Wicket after the Ewok portrayed by Warwick Davis in Return of the Jedi. 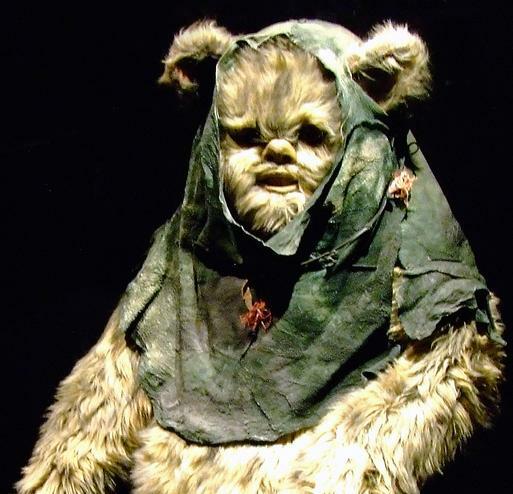 They seem to get a lot of flak for being too cute and cuddly, and it often gets pointed out how ridiculous it is that these tiny, big-eyed teddy bears were able to help the Rebel Alliance defeat the Empire on the forest moon of Endor. But when you think about it, all of the information we are given in Return of the Jedi points to the fact that on Endor it is the Ewoks that are the apex predators. I mean, they easily captured all of the heroes and would have eaten their corpses after roasting then alive had it not been for them mistaking C-3PO for a god. These creatures are smart, calculating, have a pretty complex societal structure, and are the top of the Endorian food chain. In one instance they are shown actually throwing a full-sized Stormtrooper despite the size discrepancy. The Empire is used to fighting Rebels and squelching uprisings. I imagine the guerrilla style tactics used by the Ewoks along with the element of surprise, and unassuming brutality and strength caught the the Imperials completely off guard. Ultimately, my point is that the Stormtroopers are getting the short end of the stick as far as popular culture is concerned. Sure they have their shortcomings, but through a majority of the series they were either astoundingly effective, or specifically ordered by their commanders to either let their targets escape or to herd them to a specific location. Maybe its time we start giving these bucket-heads the credit they deserve. When we look at the context surrounding their incompetence, we realize that it isn’t incompetence at all, but a complete respect for authority.